It was unseasonably warm at 6°C in my beeyard today (43°F), warm enough for the bees in most of my hives to get out for some cleansing flights, possibly for the first time in months. The bees were flying all around me and landing on me and I swear I could smell… bee farts. I looked over the bees during the transfer and couldn’t find the queen. There’s a chance she’s in there, but it doesn’t look good. I’ve done all I can. The bees won’t freeze with that light bulb. They have an exit hole close by for cleansing flights and three frames of honey. Now all I can do is wait. I think I could have saved the bees if I’d discovered them starving at least a week or two earlier. The cluster would have been larger. They would have had a better chance. Not using a caged red light bulb from the start probably didn’t help, but it was the best I could do on the spot with the materials I had available. 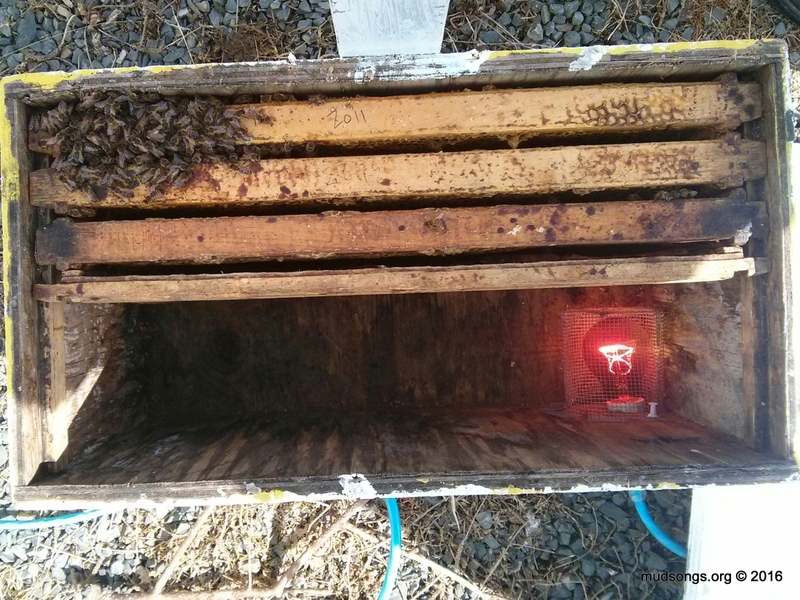 I learned about a beekeeper who uses a red light to keep his bees warm all winter. 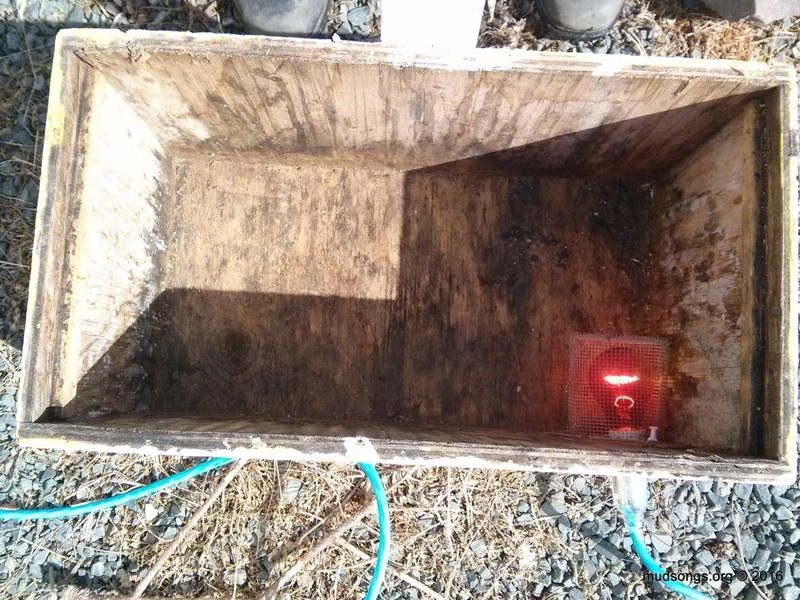 I would never do that, but I do plan to keep at least one heated nuc on standby for next winter just in case (and I’d probably use a ceramic light bulb instead so the bees can’t even see the glowing filament). I’ve also decided to pick up a thermal imaging device for my smart phone. I already have a stethoscope, which has been helpful though it’s not what I’d call a precision instrument. Cheap endoscopes are also available, though I’ve heard people having mixed results with them. But I’m pretty sure if I’d been able to take an infrared photo of my starving hive throughout the winter, I would have seen the cluster begin to shrink as it was cut off from its honey supply and I would have been able to move honey close to the brood nest and save the bees. APRIL 6, 2016: Even the caged light bulb attracted and killed some bees. If I had to do it again, I’d wrap the cage with heavy duty tinfoil, or perhaps even better, I’d use a large tin can instead of a cage and poke some tiny heat holes throughout it. Judging from what I’ve seen so far, I’d say a 60-watt light bulb, even behind a big tin can, would provide enough heat to keep the cluster and the queen alive. Continued in God Save The Queen (Maybe). One of my colonies has been quiet for a some time now and today I found out why. 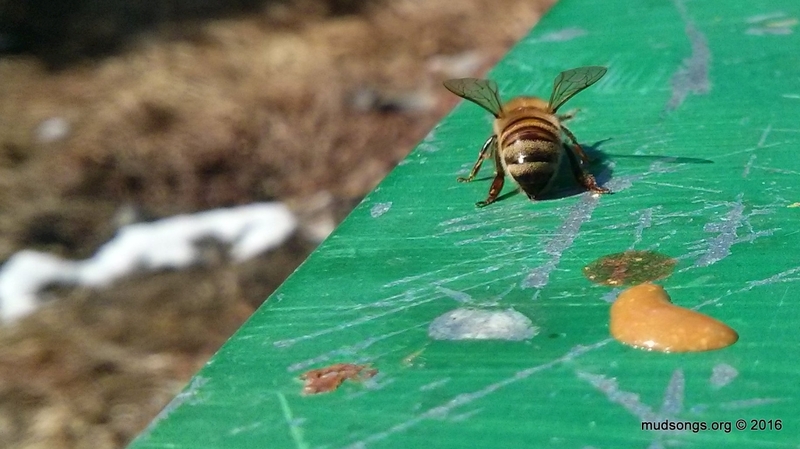 The bees have been slowly starving to death. The cluster is not much larger than my fist and it’s probably queenless by now. I took a quick peek under the hood and could tell the cluster was tiny. I also noticed poop on the frames near the cluster which usually means the queen is dead. 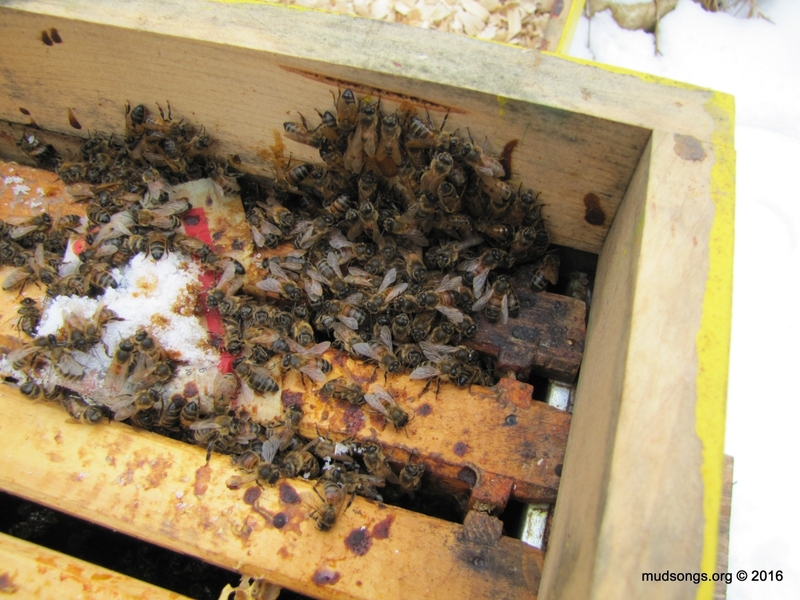 Feces inside the hive is often a sign of nosema, but the bees also make a mess of the hive when the queen dies in the middle of the winter and can’t be replaced. I’ve seen it before. In this case the cluster got so small it wasn’t able to stay warm enough to keep the queen alive. That’s my best guess. A Mouse in the Hive or No Honey Left in the Hive? Not that dead bees in the snow are unusual, but none of the other hives have many dead bees nearby, hardly any. This does not bode well.